It is recommended that you have a Bentley shop manual as a reference during this procedure. 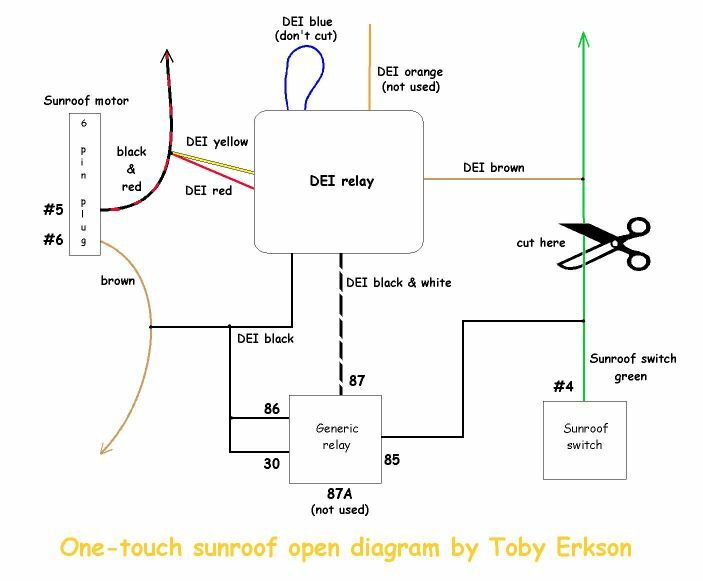 These instructions are based upon the installation of the 528T pulse timer relay (here or here) in my 1995 Jetta III GL OBD I car for allowing a one-touch operation for opening the stock sunroof. 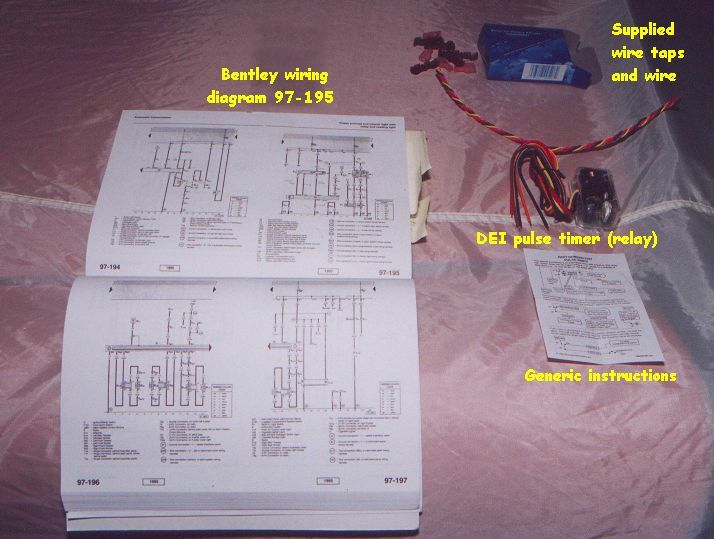 This document is meant for someone who is comfortable and skilled to work on their own car and around wires, voltmeters and crimp-on style wire connectors. As always, it is best to read this entire document, test fit and 'eye-ball' everything so there will not be any surprises during the installation. Remove the motor trim cover by pushing back the sunroof perimeter trim from the headliner and freeing the rear lip of the cover. Pull down enough to clear the sunroof perimeter trim then pull cover back (to the rear of the car). 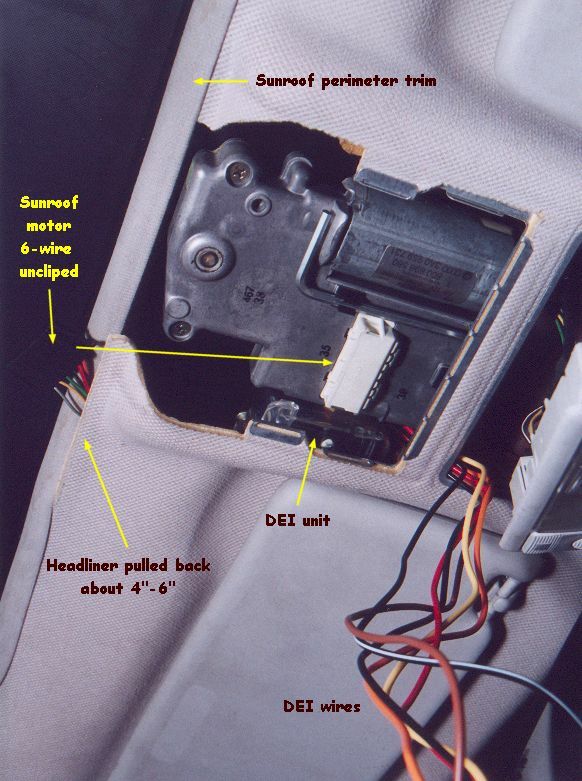 Next, remove the lights/sunroof controls from the headliner by using either your fingers or a flat-bladed screwdriver to pry the assembly away. Pull about 4 inches of the headliner away from the sunroof perimeter trim on the left side. Thread the DEI (DEI timer relay) from the motor opening to the switch opening. 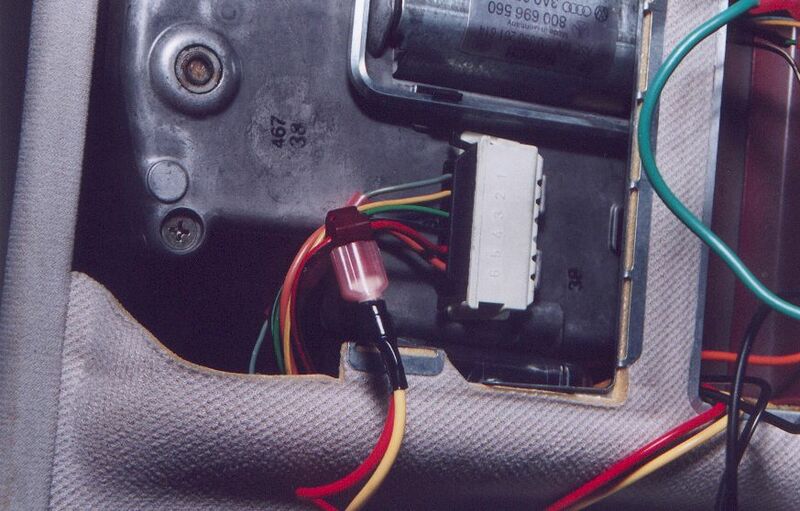 Slip the DEI above the headliner in gap to the left of the motor with the timer adjusting dial pointed towards the sunroof motor (see below image). Put headliner back into place. Wrap the end of the orange DEI wire with electrical tape and tuck it away. I stuffed mine in the foam that's in front of the switch assembly opening. Where the green wire is cut is where you would use male/female spade or bullet connectors to connect the ends to the generic relay (post #85) and the DEI (brown wire). This is what it will basically look like when done. Note that I did wrap electrical tape around the posts on the generic relay to hold the wires securely to the unit and protect them from shorting against anything. 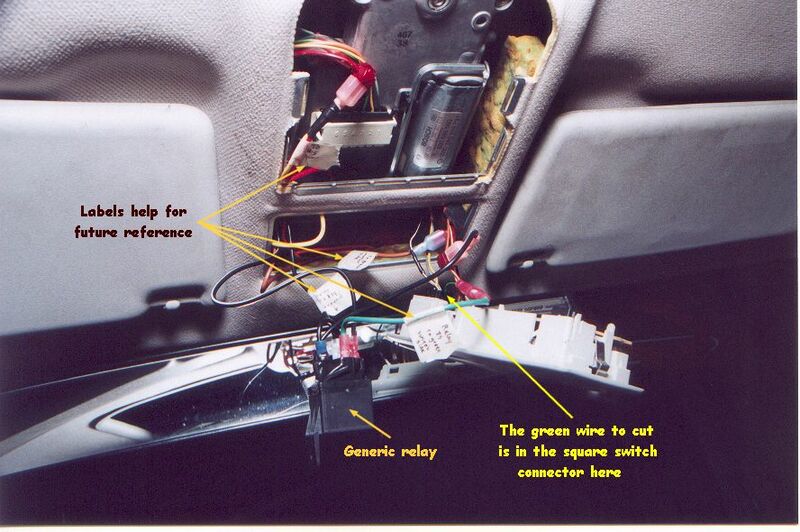 Stuff the wiring and generic relay into the switch opening, up and over to the driver side sun visor area. Push sunroof switch assembly back into place. Note: I made my adjustments from the full open vent position (sunroof tilted up). 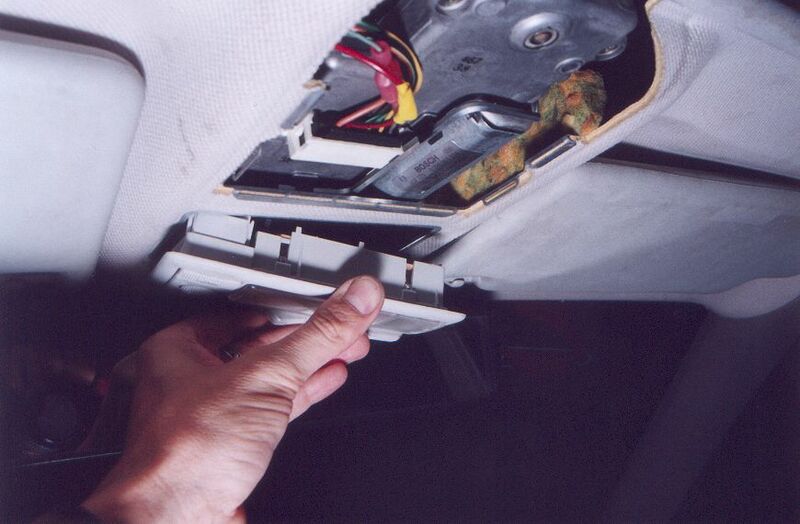 When satisfied with opening time, replace the sunroof motor trim cover. 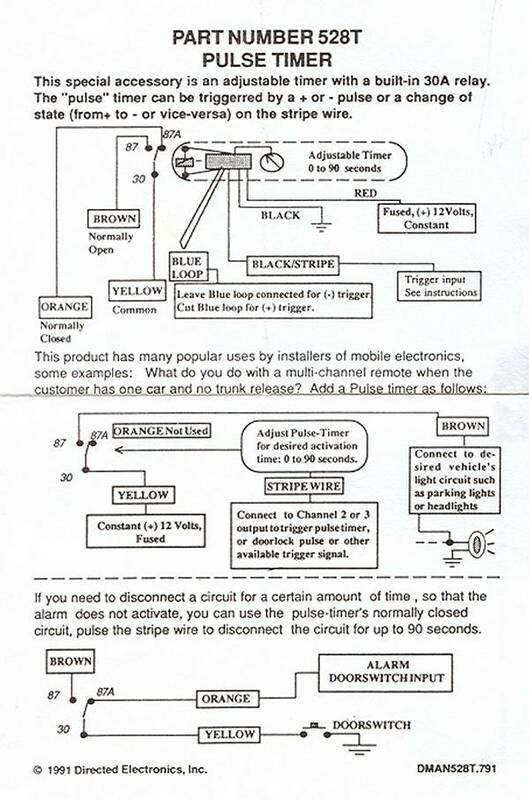 Instructions that came with the timer. Done!